Based on the ever-popular fairy tale, Goldilocks and the Wild Bears is a 5 reel, 25 payline video slot from Quickspin. Highlights here include multiplier wilds which can boost payouts by up to 4x and a free spins round where you can turn 3 extra symbols into wilds. Play on all devices from between 25p and £250 per spin. Quickspin never make ugly looking games and Goldilocks and the Wild Bears is another very well designed game. Set against a woodland backdrop, the reels include A to 10 symbols alongside a teddy, baby bear, mummy bear and daddy bear who pays 10 times your total bet if you land 5 on a line. Unusually, there are 2 wilds. The house is the standard wild – it replaces everything bar the scatter and offers awards of 2, 10 or 40 times your stake if you land 3, 4 or 5 in combination. The bowl of porridge is the second wild. It also substitutes for everything apart from the scatter. When this wild forms part of a winning line, it also provides a multiplier boost. With 1 wild, the payout is doubled. 2 wilds and it’s trebled. 3 wilds and you’ll get a 4x boost! The main feature offering is the Free Spins feature which is triggered by landing 3 Goldilocks scatters. As well as a payout equal to 3 times your total stake, you’ll also receive 10 free spins. Just like the base game, the multiplier wilds are in play during the feature. You can also add even more wilds into play by collecting the special Goldilocks symbol – known as the Bears Turn Wild feature. Each time 1 lands, it lights up a meter to the right of the reels – collect 3 and whenever the daddy bear symbol lands, it will turn wild. Collect 5 and mummy bear turns wild too and 2 extra free spins are added to your total. Find 5 more and baby bears become wild and 2 more free spins are awarded. The sound and visuals are terrific as always and the plethora of wilds deliver plenty of action. We found the variance to be in the medium range with top payouts of 819 times your bet on each spin. 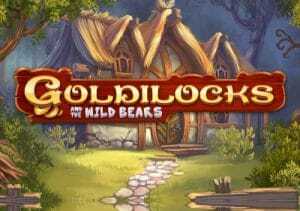 The fairy tale theme really isn’t one of our favourites – if you really must play a video slot from this genre, then you might as well make it a decent one and with its high spec looks and wild extras, Goldilocks and the Wild Bears is just that. Alternatively, Pied Piper (also by Quickspin) is recommended.